Although you can make these classic Moroccan shortbread cookies plain, they're so much better with crunchy, nutty additions of unhulled sesame and almonds. Use one or the other, or both. As with so many other ghoribas, the cookies are easily made by shaping the dough into balls which get flattened slightly. Those cracks you see on the surface are highly desirable and are, in fact, what distinguishes this shortbread ghoriba as bahla, a Moroccan Arabic term that means silly. Some might debate whether it's silly that a cookie should bake with cracks, or silly because the cracks resemble crooked smiles, but you probably won't care once you bite into all that crunchy yet melt-in-the-mouth shortbread goodness. Silliness aside, if your shortbread ghoriba do not have cracks, such as those shown in the Ghoriba with Toasted Sesame Recipe, they shouldn't be called bahla. Little attention has to be given to the texture of the dough to get those cracks. Some recipes call for resting the dough several hours or overnight, then kneading single-acting baking powder into the dough shortly before shaping and baking. This recipe doesn't require that resting step, but the dough must be worked a long time by hand or with a stand mixer to achieve the correct consistency. Traditionally Ghoriba Bahla were baked on a molded baking sheet which yields cookies with a concave bottom. Nowadays, however, many home bakers use a conventional baking sheet instead. You can see the special pan in the photo tutorial. Ahead of time, toast the sesame by spreading the seeds in a single layer and baking in a 400 F (200 C) oven for about 10 minutes; let cool. Blanch and fry the almonds, then grind coarsely. Combine the sugar, butter, and oil in a large bowl. Mix in the sesame seeds, almonds, and vanilla sugar. Mix in about half of the flour and the baking powder. When combined, use your hands to work in enough of the remaining flour to make a dry, crumbly mixture. Use a stand mixer and paddle attachment to mix the dough on the lowest speed for 10 minutes, or knead by hand for 20 minutes, to make a dough that clumps together but is not so moist as to form one uniform mass. If the dough seems to be too moist, add a little flour. Conversely, if the dough remains too dry and crumbly to pack into a ball easily, then add a tablespoon or two of oil. In either case, allow ample mixing time to blend any additions fully throughout the dough. Preheat your oven to 338 F (170 C). If you don't have a special ghoriba mold, line a regular baking sheet with parchment paper. There is no need to grease the ghoriba mold. Take a portion of dough and squeeze it in your hand to compress and mold it. Shape it into a 1 1/2" (3.5 cm) ball, then flatten it in your palm to a smooth disc shape. Correct any cracked edges. Gently press the cookie onto the molded pan or place on your prepared pan. Repeat with the remaining dough. Plan to bake in batches. Place the baking rack to its lowest position and turn on the broiler. Bake the cookies for 5 or 6 minutes, then turn off the broiler and move the cookies to the upper third of the oven. Continue baking for another 15 minutes, or until the cookies are lightly colored with crackled tops. Remove from the oven and allow the cookies to cool a few minutes on the pan. Transfer them to a rack to cool completely before storing in an airtight container with wax paper or plastic between layers. Instead of using both the broiler and baking method, you can simply bake the cookies at 400 F (200 C) in the upper third of the oven for about 15 to 20 minutes, or until lightly colored with cracked tops. How dark to make the cookies is up to you. 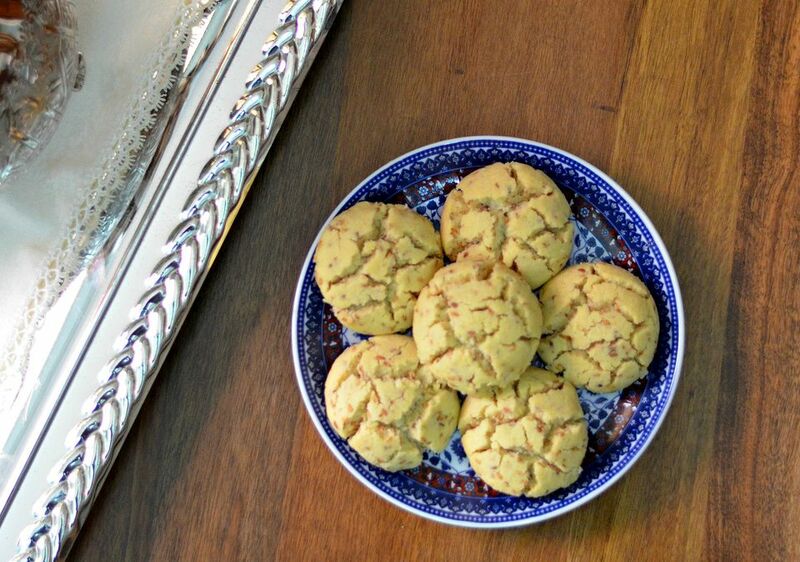 Traditionally, most shortbread recipes require baking until set and barely colored, but many Moroccans consider pale cookies to be underbaked. These should be baked long enough to achieve a dry crumb at least, but many cooks prefer to continue baking to a golden hue. Take care not to burn them. If using the specially molded pan, the dough may be shaped into flatter discs (be sure the edges aren't cracked) with thinner edges to achieve a more dramatic hollowed-out bottom. If time allows, bake a few test cookies to see how your dough reacts in your oven. My current oven, for example, heats differently than other ovens I've had, requiring that I bake cakes, cookies, and bread in the upper third of the oven rather in the middle.